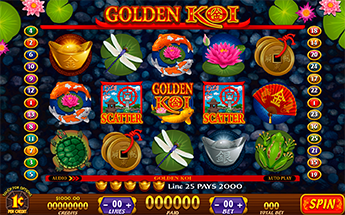 Enjoy the beauty and rewards of Golden Koi. Dragon flies, turtles and lotus flowers set the stage for tranquility. 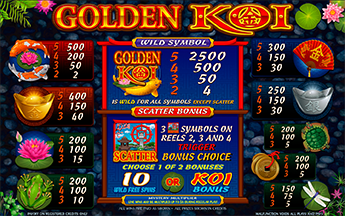 With stacked top award symbols on all reels and the choice of 50 Free Spins or the Koi Bonus when 3 Scatter Symbols land, you’ll be swimming in riches! Choosing the Koi Bonus Game will send you fishing! Pick 3 out of 12 Koi fish, with a chance to earn an additional pick. Win up to 300x your total bet! Choosing this feature will give you 50 Free Spins. Free Spins can retrigger 25 more Free Spins!